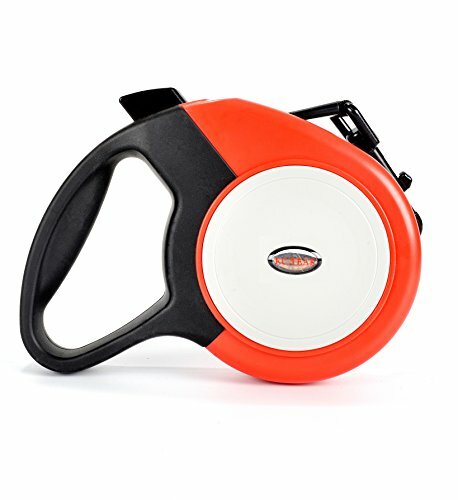 Best Heavy-Duty Retractable Dog Leash? 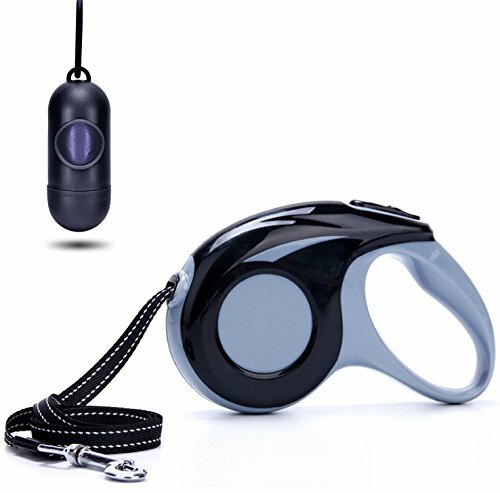 What retractable leash for small dogs? What retractable leash for big dogs? There are times when you want to give your dog the freedom to run around, sniff trees and to just be a dog, but it isn’t always possible to let your dog off leash. There might be too much traffic, too many people, and rules in place to prohibit off-leash dogs or – worse – your dog might be a runner. …The kind that runs and doesn’t come back. In these scenarios, a retractable dog leash might be the perfect compromise, as it gives your dog more range to move, while also providing you as a responsible dog owner with the option of hauling him back in if needed. 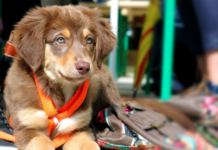 Now, once that is settled, how do you find the best retractable dog leash for your pup? There are millions of options out there, and the best thing to do is to take a few minutes to do proper research. With an anti-slip handle designed to fit nicely in the hand of the walker, this heavy duty retractable dog leash is perfect for long walks. 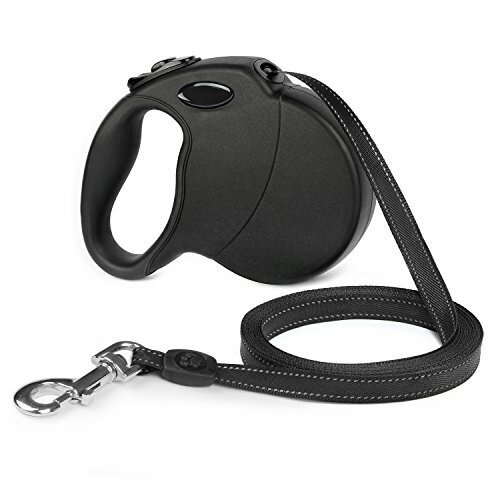 The retractable tape leash extends to 16 ft of length, giving the dog plenty of space to roam around. 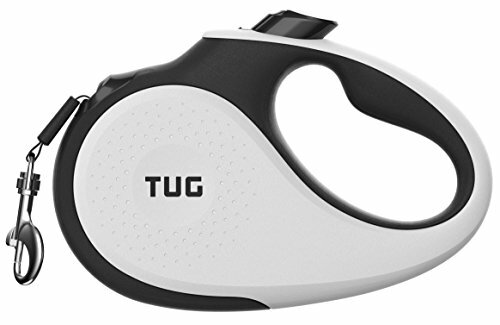 This product is also made with a patented design to prevent tangling, making it easy to control your dog no matter the angle, and the leash lock mechanism (to stop it from extending further) and unlocks with a simple movement of the thumb. You can easily stop your dog from venturing into potentially dangerous situations. 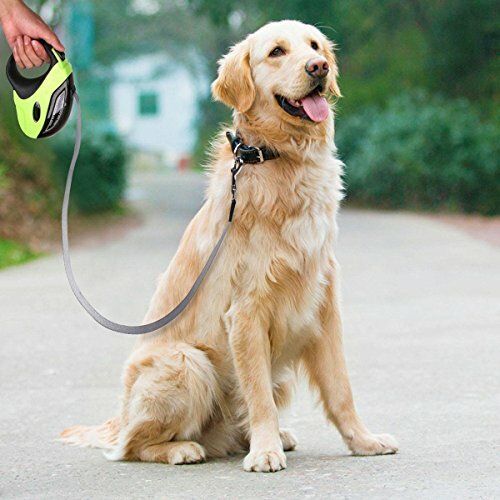 This 16ft retractable dog leash comes in three different sizes; small (max. 33 lbs), medium (max. 55 lbs) and large (dogs up to 110lbs), so that you can easily find the best retractable leash for your fur buddy. 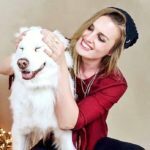 Why We Liked It – Learning to safely walk your dog with a retractable dog leash can take some practice, but this product makes it easier with its comfortable grip handle and simple lock mechanism. The anti-tangle design stops it from tangling as the tape slides in and out of the handle. For those sharing their homes with pull prone dogs, finding a strong retractable dog leash is essential, both for safety and for the owner’s peace of mind. This product features a thick 10.6 ft tape, made to provide your dog with a secure and stress-free walking experience. The retractable tape, made from reflective nylon, also makes it safer for you to walk your dog in the dark. Visibility is crucial when being out at night, and while caution must be taken by the walker at all times, this reflective retractable dog leash gives you the upper hand when protecting your dog from traffic-related dangers brought on by the lack of light. 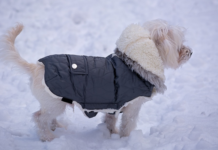 It comes in three different colors, allowing you to pick the one that best suits your personality and that of your fur baby. Why We Liked It – The reflective materials are great and make it easier for cars and traffic to spot your dog even when it’s dark. However, remember to be responsible and to not let your dog roam too freely in trafficked areas. This retractable dog lead also comes with a free dog waste dispenser attachment with bags included! Every dog loving pet parent wants to provide their fur friend with the best dog leash there is; one that lasts and guarantees safe walks, so looking for the best heavy duty retractable dog leash becomes absolutely essential. 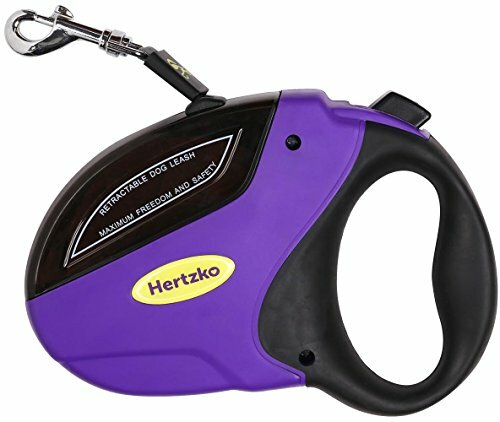 This Hertzko Heavy Duty retractable dog leash is made with durable materials, extends up to 16 ft and locks securely with the press of a button. 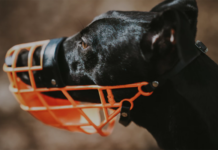 It is made to hold even if a large dog takes off running until it reaches the end of the retractable tape, though breaking off the sprint before that with the lock button is recommended. The Hertzko Heavy Duty retractable dog leash is made to fit dogs all sizes, but the clip that hooks onto a dog collar or a dog harness is rather big, making it more suitable for medium-large dogs than for example a tiny chihuahua. Chihuahua owners may be interested in these Chihuahua-friendly dog foods. Why We Liked It – This simply designed product makes an excellent retractable leash for large dogs, as it is made to hold back even the strongest of pups. The design is simple yet effective, and the handle fits comfortable in the hands of most adults. 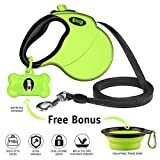 + Suitable for dogs up to 110lbs. Why We Liked It – Two of the most key features when looking for the best retracting dog leashes are durability and comfort for easy use. This long retractable leash offers both; thanks to its grip-friendly handle and quick-lock mechanism and unlock function. The durable casing of this 16ft retractable dog leash is made with eco-friendly PP materials, making it an excellent choice for environmentally aware dog owners. It comes in classy black, has reflective materials along the edges for visibility at night and is suitable for dogs weighing up to 110 lbs. 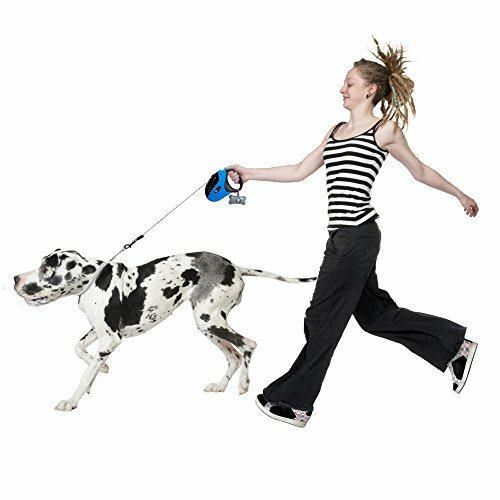 The anti-slip handle ensures that you can easily hold on to a dog even as he or she sets off after a bird or a cat. Due to its heavy-duty features and durable construction, this is a great reflective retractable leash for large dogs, although it can also be used for dogs any size thanks to its medium-sized high-quality clasp. The polyester cord gives your dog 16 ft for roaming around, so if you decide to get this dog lead – your pup is guaranteed a fun time! 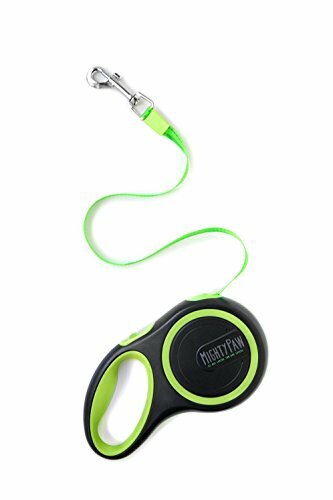 Why We Liked It – While many of the best dog retractable leashes come in bright colors, this product aims at the dog owner who wants something more discrete and with a classier look. Sleek and elegant black, while also providing all the key features that set a product apart in retractable dog leash reviews. No matter how many retractable dog leash reviews you go through, it can still be hard to trust a brand and pick a leash for your dog. 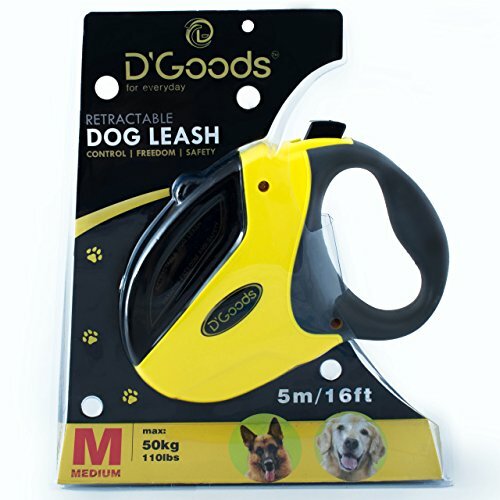 D’Goods Nylon offers a long retractable dog leash with a 100% satisfaction guarantee, and a lifetime replacement guarantee. This speaks highly of a company so clearly confident in their product, and you are making a purchase knowing that if you are not pleased with what you get – you can have your money back, or a new product should something happen to the old one. This strong nylon leash locks with the click of a button, allowing you to stop your dog in his tracks whenever you feel it’s needed. Give your dog a chance to run around with a dog lead that keeps its promises. Why We Liked It – The two guarantees offered gives peace of mind to an uncertain pet parent when shopping for an extendable dog leash for dog training and walks. A company so confident in their product can only mean quality. Here we have a retractable dog lead that offers similar features to many others on this list; with an ABS casing, an ergonomic handle for a more comfortable walking experience and a cord which extends up to 16 ft. An interesting feature of this TaoTronics retractable dog leash, however, is its resistance to extreme weather conditions. 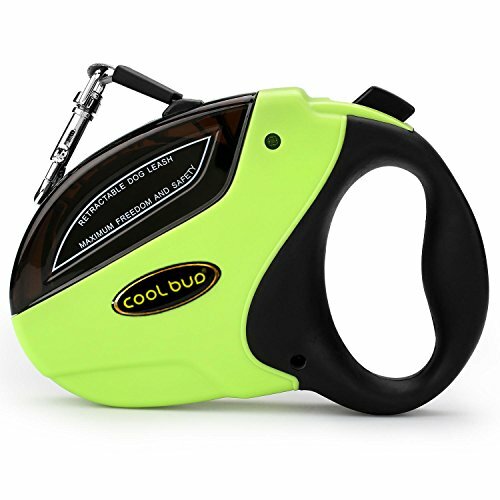 This extra long retractable leash promises a high-quality performance in cold temperatures reaching down to minus 86 degrees F. The 16ft retractable dog leash cord is also water resistant so that you can take your dog to play in the water while you stay safely on the beach! Why We Liked It – For dog owners living in colder climates, it is great to know that this TaoTronics retractable dog leash does not freeze easily, which could cause it to tangle or stop working correctly. 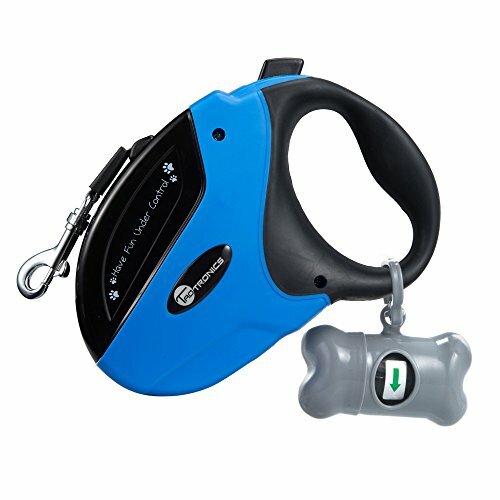 A great heavy duty retractable leash for dog training. 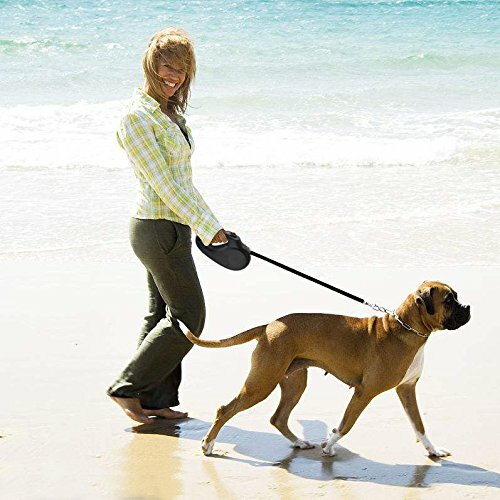 This is possibly one of the longest retractable dog leashes on the market and extends up to 16.5 ft. Its handle is designed to fit most adult hands, to make sure the walking experience is equally fun and effortless for both dog and owner. The clasp is anti-corrosive for longer durability and meant to fit dogs of all sizes. Might not be suitable for miniature breeds due to the weight of the clasp. The break- and lock button sits conveniently on top, making it easy to stop a dog from running in an unwanted direction while using this retractable dog lead. Why We Liked It – What you really want to find is a durable retractable dog leash for training your dog, one that keeps your dog safe while running around and having fun, and that is what you get with this product! We like that comes in one size for all types of dogs, so that you can get it for a puppy or a growing dog and keep it until adulthood. Choose between two different sizes; ‘light’ for dogs up to 50 lbs, and ‘standard’ for dogs weighing up to 110lbs. The small retractable dog leash is great for smaller breeds, as it comes with a smaller clasp that doesn’t weight them down. You may be interested in a small dog harness, too! It comes in gray/green and black/orange, for you to choose an option that goes with your style. Go for a fun run in the park, knowing that you can lock the pet leash and haul your dog back to you, with a quick click of a button! Mighty Paw is an American company based in Rochester, NY. Why We Liked It – While it is great to see many retractable leashes for large dogs and small dogs combined, it is also nice to have a product like this one where one can choose a smaller size for a small fur friend. Miniature dog breeds are sensitive to additional weight, which means they might need a smaller clasp than their larger brothers and sisters. The Urpower Upgraded Heavy Duty leash for training your dog combines a sleek and attractive design with high-quality functions and impressive durability. It now comes in two sizes; one retractable leash for big dogs, and one for their smaller fur friends and companions. Get a leash tailored to your dog’s size, needs, and capacities, so that you can enjoy hassle-free walks that are fun and rewarding for your pup. Its anti-tangle handle opening allows you to retract the pet leash from any angle, without risking it getting all tangled up. To not let your leash slow you down on your walks may seem obvious, but products like these make it so much easier to live up to. Why We Liked It – Finding the strongest retractable dog leash, one which you can trust no matter what to keep your dog safe, is not always easy. We appreciate that this product has not only a strong nylon ribbon but an anti-tangle design to make sure it doesn’t tangle into a knot when you and your dog are out having fun. 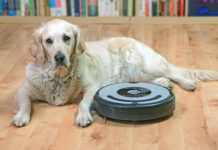 Knowing what to look for will greatly aid in the process of going through retractable pet leash reviews, as it will give you a head start in sorting through the thousands of products available. There are several different leash lengths to choose from, some extending as much as 16.5 ft! When choosing retractable leashes for big dogs, a longer one might be of preference, as bigger sized dogs take longer steps and need more range to move freely. A smaller sized dog, on the other hand, is likely to be fine with a 10 ft. pet leash, but it depends entirely on the preference of the owner. The benefit here is that a retractable dog leash largely adapts to every owner’s individual needs, as they can be stopped and locked with the click of a button at any length. Just hit the button, lock it, and your dog is stuck at whatever length you choose. Keep in mind that long retractable pet leashes are harder to control, and it is important to learn how to properly use a retractable dog leash. Only use it in places where your dog can roam freely, and not in trafficked areas or where there are lots of people. Be careful when rounding corners and try to keep your dog close to you when you do, since you never know what might be on the other side. Along pet leash is only a good idea if used responsibly, and not in a way that could endanger your dog or bother other people and/or animals. Durability becomes especially important when looking for a retractable dog leash for large sized dogs, as it needs to be able to support their weight and guarantee that the cord or clasp doesn’t break if the pup takes off running. Look for a heavy-duty nylon- or polyester cord, if possible with reflective materials added to it for additional visibility and pay attention to the materials used in the making of the handle. ABS plastic is commonly used in handles for this type of product, and it is frequently found in the top pics on retractable leash review websites, which says a lot about its durability. Holding back a pulling dog with a regular leash is one thing, but having a dog run at full speed until a retractable leash reaches its full length is something entirely different. Such a force requires a lot from a product like this; both from the handle, the cord or tape and from the clasp that attaches to the dog training collar or dog harness. 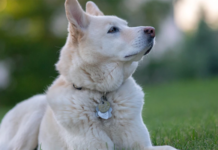 Pay attention to retractable leash reviews from customers and combine that acquired knowledge with your own perceptions and your needs as well as requirements, and you are sure to find a fitting model. While a lot of these products promise to be a good fit for dogs all sizes, it is important to remember that very small dogs might need a smaller clasp, meaning a one-size-fits-all option might in reality only be the best retractable leash for large sized dogs. Read carefully on each product to see what the maximum weight is that the leash can safely support, then base your decision on that rather than anything else. After all, the most important thing when buying a retractable leash is that it can hold the weight of your dog, or a devastating accident might be in the making. This is really the only size issues; how much weight a leash can support, and to not get a leash with a large dog collar and harness clasp for a tiny dog, as it will weigh him or her down. Besides this, most large sized retractable leashes make great fits for medium dogs, large dogs, and extra-large sized dogs. When dealing with long cords, unless the construction of the handle is well-planned and executed, the cord runs the risk of getting tangled when retracting into the handle. You don’t want to have to stop mid-walk to untangle your dog’s leash, possibly while he or she eagerly pull to continue walking, so look for a high-quality product designed to provide a tangle-free experience, by allowing the cord to glide effortlessly back into the handle every time. Everything comes down to the material of the cord and the design of the retracting pet leash handle, and it is worth spending a few more dollars on a quality product. The Hertzko Heavy Duty retractable dog leash is an excellent choice for the pet parent in need of a heavy-duty retractable leash. As its name indicates, it comes equipped with a super strong flat cord to hold for even the largest dogs and most enthusiastic pullers. 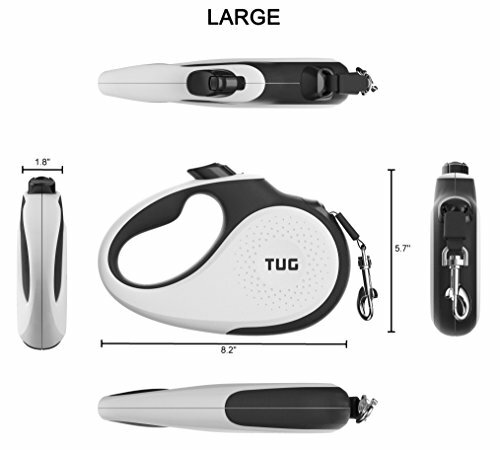 For a small dog, consider getting something in style with the TUG Patented 360° Tangle-Free, which comes in sizes made even for the smallest of furry family members. What makes this particular product stand out is that it offers the same cord length (16 ft.) on their small sizes as they do on the bigger ones, meaning your small dog can enjoy the same running range as their larger companions. A good option for a big dog, especially those living in colder climates, would be the TaoTronics Retractable Tangle Free. This retracting pet leash does not weaken in extreme temperatures and can handle down to minus 86 degrees F without it compromising its durability and function. This is great for big and strong dogs, as the leash can be used on most occasions without compromising the safety of the dog. A retractable dog leash gives your dog the chance to experience freedom in a controlled form, where you can step in quickly if things would go wrong. The longer the least, the bigger the freedom, but also the more responsibility of the owner. Pick a product that fits your needs, read a bit about them, check reviews such as for the best retractable dog leash for large dogs (depending on your requirements) and then finally – make a decision. You rarely go wrong with top rated products, and your dog will thank you once he is running (almost) freely in a park somewhere. Be respectful to others when using a retracting pet leash, and don’t let your dog run up to people or dogs unless they give their permission. It is, after all, a leash, and we are all responsible for our dogs and their behavior. A retractable leash is a great tool for training your dog! Use it when practicing the ‘stay’ and the ‘sit and stay’ command or teach your dog to stop when you tell him to! Do it safely using a retractable leash, as it allows them to feel like they are free to do as they like when they really are not. Practice during walks and outings and let it become part of your walking routine. 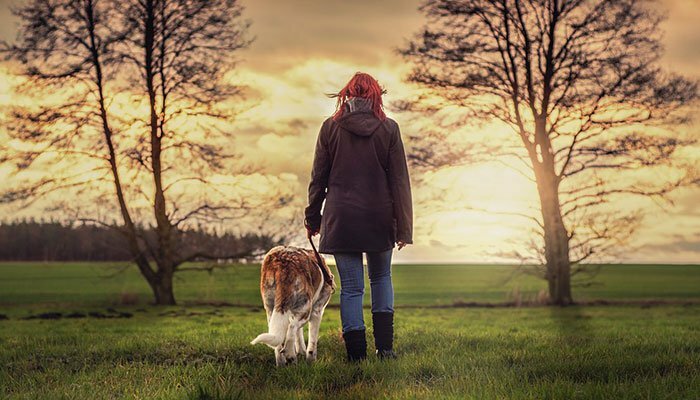 Read more about the benefits of dog walking.